Cat Variety: Created Kind or Evolution? Was Adam a Real Person? Why do Evolutionists have a Population Problem? How are we Saved? What Must I do to be Saved? Is Jesus God? Jesus is God. 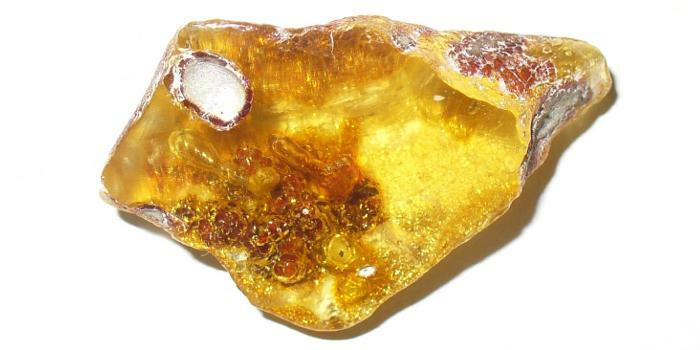 Amber is fossilized tree resin. When the resin is soft and sticky it sometimes catches insects, spiders, pollen, or other objects. 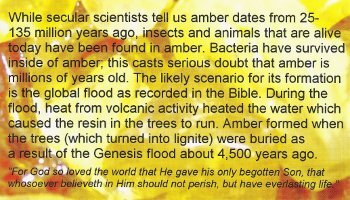 Evolutionists believe that amber formed millions of years ago but many times the specimens trapped in amber contradict this belief. Researchers from California Polytechnic State University were able to isolate a bee trapped within a piece of amber that is supposedly 45 million years old. Within the bee's gut they were able to recover and reanimate yeast and bacteria that had not degraded in 45 million years. This yeast was used by Stumptown Brewery in Guerneville California for its brewing process to make beer. How can organisms survive totally intact for millions of years? Specimens such as ants, crustaceans, tadpoles, lizards, annelids, snails, spiders, hair, a whole frog, a normal feather, a gecko foot, and flower pollen have all been found trapped inside of amber and are exactly the same as they are today. Evolution teaches that slight changes over millions of years are responsible for creating new kinds of animals; however, from the evidence trapped in amber we can see that there has been no changes over the supposed 100 million years of history. The Bible teaches that God created this world about 6,000 years ago and about 4,400 years ago there was a world wide flood. 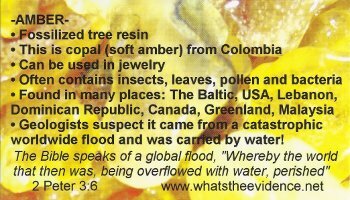 The flood would have destroyed large forests facilitating the rapid production of amber that would be rapidly buried and preserved. The biblical account would also explain why we find marine organisms trapped inside of amber. Before the flood in the days of Noah the Earth was very different. Air bubbles in amber show up to 50% more oxygen than the air today. This would allow the dinosaurs to get huge (Behemoth - Job 40) and people to live longer (Genesis 5) just as the Bible says. Each of the icons below represent a publication that has been developed by people from the county fair group.